What is a HS code and why do you need one? Do you intend to import or export goods? Do you require information on duties, documentation or taxes? Then you will need a commodity code. 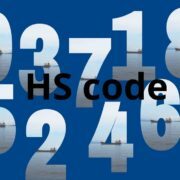 A HS code, also known as a statistics number or commodity code, is a 10-digit code with which any tradable commodity is classified. This system of codes is used worldwide. Internationally the first 6 digits are the same. The last numbers may vary per country or region. Can I determine a HS code myself? Though it is possible to determine a HS code yourself, it’s always recommended to consult a specialist, because there are risks involved. If the wrong HS code is used you might pay too much or too little customs duties. Customs also can do retrospective checks, looking up to 3 years back and can claim back any unpaid duties. This can lead to fines or sanctions. To have complete assurance that you have the right HS code, you can ask customs for a “Binding Tariff Information” (a BTI). The BTI is then applied to the same commodity, throughout the entire EU.